100% volunteer-run, mountain climbing, cancer-cure focused nonprofit 501(c)(3) organization. Our mission is to improve cancer care, specifically radiation oncology care, around the globe. John is a Professor of Radiation Medicine at the University of California San Diego and director of its radiation oncology residency program. He specializes in the treatment of cancers of the breast and prostate and is particularly interested in the treatment of cancer with brachytherapy. He has been named twice as a “Top Doctor” by San Diego Magazine and has been named a Fellow of the American College of Radiation Oncology. 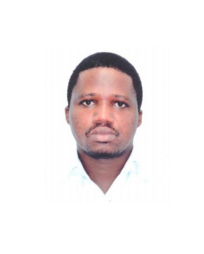 He became involved in Radiating Hope through the Senegal high-dose-rate brachytherapy project where he worked with our amazing team to treat the first cervical cancer patients with curative radiotherapy in 2013. He is originally from White Bear Lake, Minnesota and earned his MD degree from the University of Minnesota in 1991. He moved to San Diego in 2002. In his free time he is an avid road biker, occasional mountain biker and frequent traveller. 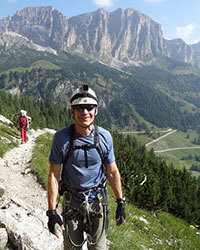 He also enjoys hiking, mountain climbing, skiing and Via Ferrata. His favorite mountain is Mt. Rainier which he climbed a number of years ago. He has also climbed Villarica in Chile and aspires to climb Kili on a future Radiating Hope climb. 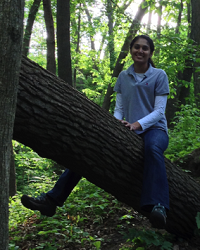 Mira is currently a fourth year resident in radiation oncology at Henry Ford Hospital in Detroit, Michigan. She completed her undergraduate work in South Asian studies at Northwestern University after which she helped to conduct cancer patient health-related quality of life research and taught preschool in northern Chicago. Her medical education was completed at Stritch School of Medicine, Loyola University. Mira sits on the Association of Residents in Radiation Oncology (ARRO) board through which she is involved in the global health subcommittee. Tosh Rymer was born and raised in Utah where he continues to enjoy mountain biking, rock climbing, skiing, mountaineering, and competing in triathlons. He received a Bachelor’s degree in Business Finance from the University of Utah, and is currently working on getting his MBA from Westminster College. Tosh believes that time is best spent outdoors and with his family. He also feels that the best way to know one's self is by serving others, and is looking forward to assisting with the business and marketing needs of Radiating Hope. Tosh successfully summited Mt. 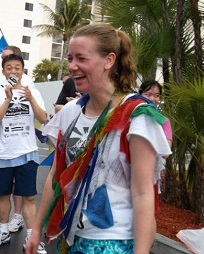 Kilimanjaro as a prayer flag climber in 2009. Tom also played football in college and briefly in the NFL with the Cincinnati Bengals before sustaining an injury that ended his career as a professional athlete. He then worked in corporate settings before starting his own company with diverse business ventures in real estate, construction, educational media and logistic solutions. These experiences and his volunteer work have honed his skills in business development, project management, and strengthening communities, which he now applies to furthering the work of Radiating Hope. Having personally lost loved ones to cancer, Tom is committed to helping cancer patients worldwide gain access to treatments and improved cancer care. In his free time, Tom loves playing golf, fishing, kayaking, stand-up paddle boarding, and indoor climbing with his family. 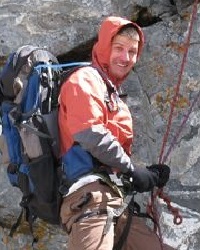 As an avid rock and mountain climber, Brandon Fisher hails from Salt Lake City, Utah. He is a radiation oncologist with Gamma West Cancer Services in Utah and also volunteers with the Weber County Search and Rescue team. 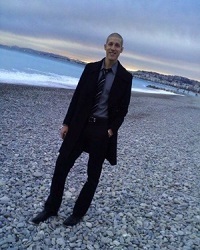 Brandon is the co-founder and past president of Radiating Hope. He is also a board of director of Above and Beyond Cancer. He is also an executive member of the Cervical Cancer Research Network which promotes clinical trials in low to middle income countries. He is a super-advocate for global cancer care equality and strives to advance cancer care in developing countries. Brandon participates with the American Brachytherapy Society (ABS) and the American Society of Radiation Oncology (ASTRO) on their International committees and workforce teams, as well as the young physicians committee to the Board of Chancellors of American College of Radiation Oncology (ACRO). He has successfully made it to the summit of several of the world highest mountains, Aconcagua, Kilimanjaro and Elbrus, Mt Denali, as well as Mt Rainier, Mt Washington and others. He feels our well-being is a product of meaning we create! 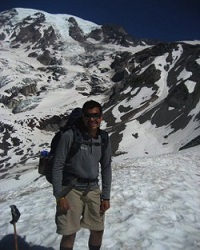 Larry grew up in the Seattle area and became passionate about the outdoors at an early age as a Cub Scout. He belongs to a large family with seven sisters and has continued that tradition with 5 kids of his own, 3 boys and 2 girls. He is his kids' Dad and dives into whatever they are doing at the moment. Larry started his career as a paramedic and firefighter, a career he enjoyed for nearly ten years before deciding to go to medical school. Now a medical doctor, Larry works at the Mayo Clinic in Jacksonville, Florida. He is a radiation oncologist and specializes in treatment of sarcomas and gastrointestinal tumors. Larry has been actively involved in humanitarian efforts in Ghana, Peru, Mexico and inner-city areas of the United States. 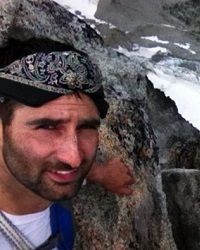 He enjoys rock and especially ice climbing. His mountain resume includes Aconcagua and summits of Mt Washington, Mt Rainier and Mt Elbrus. 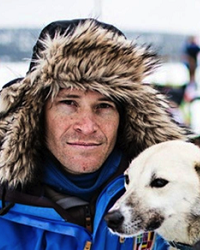 He was a proud participant in the 2013 Fjallraven Polar dogsled adventure and was able to carry the prayer flags on his sled for over 200 miles across the arctic tundra. Radiating Hope is pleased to have Luther Brady as a distinguished consultant and board member. 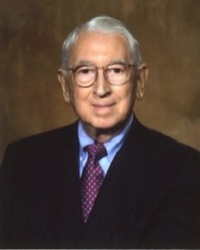 Dr. Brady is one of the world's foremost oncologists; he has held the rank of Professor since 1963. No one in the specialty of radiation oncology has had the breadth and depth of involvement as Dr. Brady. During his career, he has served as President of every major professional society related to the field. He is a Fellow of the American College of Radiology and a Fellow of the American College of Radiation Oncology. He has been a member of the American College of Radiology Board of Chancellors, Chairman of the Commission on Radiation Oncology, and has served on numerous College committees. As well, he was Chairman of the Radiation Therapy Oncology Group, a nationwide consortium to evaluate forms of cancer treatment. Dr. Brady is one of the most prolific investigators in the history of radiation oncology, with over 600 publications to his credit. Dr. Brady has received countless honors, medals and awards throughout his distinguished career. Ron DiGiaimo knows the radiation oncology world from the ground up. Formally a radiation therapist, he is now the CEO and founder of Revenue Cycle Inc. and has more than 23 years in clinical, mid-level and executive level management, clinical experience and financial management. Ron is also a proven strategist in practice-building and has broad experience with marketing, operations, development and public relations. Ron is active with ACRO, ASTRO, SROA, ACCC, ACE, AAMD, ASCO, ACHE and several other groups, whose missions forward the cause of oncology. Ron earned an MBA from Oklahoma Christian University, a bachelor of science in health services administration from Weber State University, Utah and an associate's degree in radiography from MCC in Waco, Texas. Perhaps most importantly, Ron prides himself on strong ethics and integrity. Dr. Mundt is the Professor and Chair of the Department of Radiation Oncology at the University of California, San Diego (UCSD) and he currently sits as the President of the American College of Radiation Onology (ACRO). Dr. Mundt is an internationally recognized radiation oncologist and has published over 100 journal articles, book chapters. Dr. Mundt specializes in gynecologic malignancies. He has been an invited speaker at over 150 seminars, symposia and workshops in the United States and abroad, including in Australia, Brazil, Canada, Chile, China, England, Japan, Korea, Mexico, Panama and Taiwan. He has been a visiting professor at numerous prestigious Universities, including the Mayo Clinic, the University of Michigan, Washington University, and Emory. He is a guest reviewer for 8 cancer journals and serves on multiple Advisory and Editorial Boards. Dr. Mundt has been named Top Doctor for Cancer as well as a Top Doctor by the Chicago Magazine. 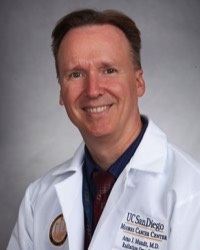 He has been named a Top Doctor by the San Diego Magazine three years in a row. Outside the hospital, Dr. Mundt is an talented classical pianist, avid racquetball player and former tennis partner of one Barry Obama, while growing up in Honolulu, Hawaii. He enjoys travel and has a considerable interest in foreign languages, having studied 8 languages (his best are French, German and Italian). Born and raised in a small town in Central Illinois, Cecil now considers himself one of Seattle's finest. He left the graduation ceremony from Illinois state, crammed his diploma in his glove box and headed out west to begin the rest of his life. After 7 years of the restaurant industry, where he lead in the opening of two new restaurants, he left the hungry faces and decided to go into health care. He now has one year left in his Nursing program with future aspirations of becoming a Nurse Practitioner. He claims he switched careers because he wants his life work to be focused on helping the sick and not the hungry, but we really know he's just psyched on having that 3 days on, 4 days off schedule so he can climb more. Three years ago Cecil founded a small organization called Climbing for Crohn's and Colitis which raises money for the CCFA and inspires others to climb for the cause. He has now summited Mt. Rainier 4 times, Kilimanjaro, Mt. Adams, Mt. St. Helens, and various alpine peaks in the North Cascades. His passion for climbing and helping others is limitless, just like his appetite. Adam is a radiation oncology medical physicist, currently working at Overlook Hospital in Summit, New Jersey. He graduated with a Master's degree in medical physics from Vanderbilt University in Nashville, Tennessee. He is a member of the American Association of Physicists in Medicine, where he also is a member of the subcommittee on Medical Physics in Africa. Prior to moving to NJ, Adam spent three months in Senegal, West Africa where he volunteered his efforts at Institut Curie de LHopital Aristide Le Dantec radiation therapy cancer center. Since his return, he has been dedicated to renovating and modernizing radiation therapy in Senegal, and throughout Africa. Shilpen is a radiation oncologist at the University of Washington. He currently works an associate professor and specializes in lung and gastrointestinal tumors. He moved to Seattle in 2006, and prior to that he trained at the Greenebaum Cancer Center in Baltimore. Shilpen currently works with a number of organizations to improve health care, including the American Medical Association (AMA) and Washington State Medical Association. He earned his MD from the University of Texas and has published extensively in the medical field. He has recently been named one of Seattle's Top Doctors in Seattle Magazine and Seattle Metropolitan Magazine. He has also won one of five AMA Foundation Leadership Award and was selected as a Fellow of the American College of Radiation Oncology. Shipen has served on the American College of Radiation Oncology's Board of Councillors since 2005 and is the delegate from the American Society for Radiation Oncology (ASTRO) to the AMA. He enjoys camping, hiking, skiing, and mountain climbing. His favorite climbs include Mt. Fuji, Rainier, Orizaba, Baker, Iztaccihuatl, and Adams. 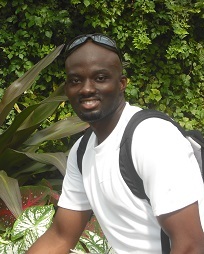 Nathan was born and raised in Tamale in the Northern Region of Ghana, West Africa. He spent his childhood playing soccer on the streets and exploring the vast savannah grassland. He moved to the United States and obtained his BS in biology and biotechnology from Calvin College in Grand Rapids, MI. He went on to attend Medical school and the University of Chicago Pritzker School of Medicine. He is now a PGY-4 resident in Radiation Oncology at William Beaumont Hospital in Royal Oak MI. He has served for two years on the American College of Radiation Oncology resident committee, being in charge of Global Health and Governmental Affairs. Nathan has experience in global oncology in Ghana and Nigeria and currently serves as the Ghana project director for Radiating Hope. He is an avid soccer player and plays in various leagues in the metro Detroit area. He also enjoys going on hiking trips and is looking forward to picking up mountain climbing; first target, Kilimanjaro! Brandi Page is a board certified radiation oncologist. She completed her general surgery internship in Seattle WA, her radiation oncology residency at the Huntsman Cancer Institute at the University of Utah, and her fellowship in translational/clinical radiation oncology at Wake Forest University in North Carolina. Brandi enjoys running and competed in track and field/cross country at Claremont McKenna College. She joined Radiating Hope in 2011 and has helped organize events for Radiating Hope including our very first 5k race in Salt Lake City, as well as engaging local medical students in the Care Package Project for women cancer patients receiving radiotherapy in South America. Brandi enjoys running all types of mountains and climbed up Mt. Fuji with her twin sister Brooke in 2004, racing up and down the mountain together. She hopes to climb more mountains in honor of her patients. Ben and his wife Laurin grew up in San Diego, California. After school at TCU and Texas A&M, Ben completed his medical training at William Beaumont Hospital in Royal Oak, Michigan. He currently is a radiation oncologist with Willis-Knighton Cancer and Proton Therapy Center in Shreveport, Louisiana. He also is an assistant professor at LSU Health Science Center in Shreveport. Ben primarily treats brain and spine tumors, children with cancer, as well as lung, breast, and prostate tumors. Professional highlights include an opportunity to work with Drs. Alvaro Martinez, Frank Vicini, and Larry Kestin during residency. Throughout his four years of training at William Beaumont Hospital, Ben enjoyed learning about the importance of clinical research and compassionate patient care. As a resident, he also had the opportunity to work on several committees for ACRO where he first learned about Radiating Hope's important mission. After training was completed and moving to Shreveport, Ben's radiation team was recognized at LSU Shreveport's 2015 Evening of Healers event for excellent care of a young child diagnosed with a very large Wilms Tumor. Ben is married and has three young daughters. He enjoys traveling with his family and time at home with the girls. George Felix Acquah is a native of Cape Coast in Ghana, West Africa and lived in Accra, Ghana. 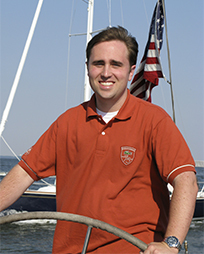 Since 2003, George has undergone both undergraduate and graduate education in physics/medical physics. His physics background and passion to work in the clinical environment has led him to take a number of physics related medical opportunities. His love to share his knowledge with others has seen him trained and mentored 25 graduates and 8 undergraduate students across Africa. He has and still serves on a number of committees. George received his Bachelor of Science in Physics at Kwame Nkrumah University of Science and Technology, Kumasi, Ghana and a Masters in Medical Physics at the University of Ghana, Legon, Ghana. 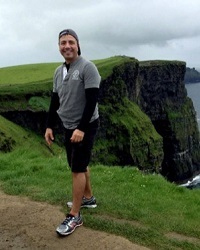 A graduate of the University of Western Ontario, Derek joined the faculty of the University of Calgary prior to his recruitment to UCSD in 2014. 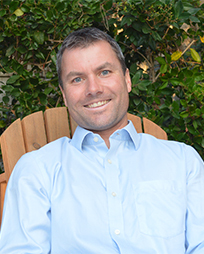 He serves as the Program Director of the Medical Physics Residency Program, a role he also occupied at the University of Calgary, and is Director of the UCSD Radiation Oncology Learning Center. Derek has a strong interest in Global Health Care and is active in the organizations Radiating Hope and TreatSafely which are dedicated to improving access to modern radiotherapy and to developing practical educational material. 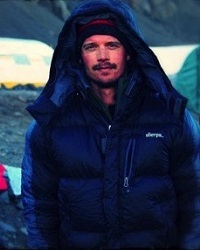 David has climbed some of the world’s highest peaks. His love for mountaineering and philanthropy is evident in his passion as our Mountaineering coordinator, where he works together with our climbing guide service partners to ensure superior and safe experiences. David received his bachelor’s degree in Management from the University of Utah and his Masters of Business Administration at Utah State University. 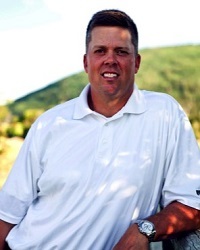 David and his wife Tiffany, have three daughters and live near the Wasatch Mountains in Utah. 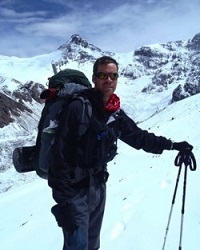 David is an expert in mountain logistics and has guided and led teams to the tops of mountains all over the world. It's such a pleasure for us to work with Cotopaxi. They are an outdoor gear brand with a humanitarian mission: At least 10% of profits benefit Cotopaxi’s partner organizations, eliminating the worst forms of poverty across the globe. Cotopaxi makes "Gear for Good" and donates a significant percentage of each product profit to worthy non-profits. Sherpa Adventure Gear supports Radiating Hope climbers by providing our climbers with discounts on gear. They support our mission in advancing cancer care in developing countries.  A Nepal based company, Sherpa donates part of the proceeds from every product sold to a fund for the underprivileged Sherpa children of Nepal. Dharma Shop, a firm supporter of our mission and cause, provide us with our prayer flags. Founded by Sander and Christy Cohen, Dharma Shop's goal is to build an online community that supports the Tibetan, Newar and Nepalese people. A portion of all their proceeds go to fulfilling this goal. Kilimanjaro’s own guide service, ClimbKili, is the premier trekking company for climbing to the rooftop of Africa with over 3 decades of adventure experience. Year after year, they have a near perfect summit success rate and the highest safety standard. Hakuna Matata! Climb, trek, fly, bike and ski: 360 Expeditions has it all. We partner with 360 Expeditions for all our Asian climbs, trekking in Nepal and beyond. Their leaders have an extensive range of abilities, including in-depth wilderness first aid and survival skills, heightened cultural awareness, and field communication proficiency. Locally owned and operated in Mendoza, Argentina next to the Andes range, the Summit Aconcagua guide service helped us get to the top of Aconcagua! They are dedicated to our mission of not only making it to the summit but also in advancing cancer care throughout the world. The SummitOrizaba.com guide service has helped us get to the top of Mt Orizaba multiple times. Who would have thought that such an enormous mountain would be in the heart of Mexico, but there she stands - Mt Orizaba at 17,373 feet above sea level, the highest peak in Mexico. Headquartered in Utah, Campsaver gives RadiatingHope climbers significant discounts on their quality gear. They use the gear they sell, so they understand the simple joy in having clothing and gear do what it is supposed to do, and do it well. They provide a great selection that runs the full spectrum of outdoor products. At Black Diamond, it's all about climbing and skiing. With locations on three continents, they have transformed into one of the most trusted outdoor equipment suppliers on the globe. They have also supported us at RadiatingHope with ongoing discounts on outdoor gear. Photographer. Extreme mountain climber. Combine the two and you get one amazing man! Luke Allen Humphrey is our extraordinary photographer. He captures some of the most breathtaking landscapes. If you love the pictures on this site, there is a good chance that Luke took it. Brimming with talent. TreatSafely is dedicated to the development and deployment of novel teaching and mentoring programs that standardize practice and improve quality and safety in radiation medicine. i.TreatSafely.org is a free website that provides access to high quality, practical training videos that guide users through complex clinical and QA tasks.